Non ringers may be interested to know when the bells are going to be ringing, and why, and perhaps who is ringing them. Some bell ringing terms may be baffling. Follow the links for explanations. Thursdays: We practise 19:15 to 21:00 on a Thursday evening. This is for as many of our band as are available, plus any visitors. You will hear ringing on 6, 8 or 10 bells, with brief silences while the ringers change over. The practice tends to start with simpler things on 6 bells, and progresses to more complex things on 8 or 10 bells. Sundays: We ring for morning service (09:20 to 09:55) and for Evensong (17:30 to 18:25). We try to maintain a high standard of ringing on Sundays. Normally ringers will take it in turns to ring (called general ringing) but occasionally we will ring a continuous piece for Evensong known as a quarter peal, and any of these are shown on our Ringing Calendar. The ringers' events may be partly organised for pleasure, but they are also an essential part of maintaining a band of ringers that ring for services at a high standard. Periods of sustained ringing – peals and quarter peals – are particularly useful for this. The Abbey clock is provided and maintained by Hexham town council, and it has mechanical chimes which automatically chime the Abbey bells every quarter of an hour. The heavy chiming hammers have to be lifted clear of the bells before the bells can be rung. Once the bells have been rung "up" into the raised position (mouth upwards), they cannot be chimed by the clock. We would normally ring the bells down after we have finished ringing as it is safer and good practice to do so. We can then put the clock chimes back on. There are exceptions to this. Sometimes it is necessary to leave the bells in the raised position so that they are ready to be rung for another event or service for which there would be insufficient time to ring them up. For example, on a Sunday the bells are normally left "up" between morning ringing and evening ringing, or if the bells are rung on a Friday evening, they may be left up for a wedding the following day. So if the Abbey clock is not chiming, it is likely to be because it has been necessary to leave the bells up. Association Ringers have formed larger organisations, often called associations, which link ringers within a region. An association is often based on the diocese. All Hexham ringers, as well as being members of the Hexham Abbey Guild of Bell Ringers, are also members of the Durham and Newcastle Diocesan Association of Church Bellringers which covers an area from Berwick to Darlington. Change Ringing In change ringing, bells change position with each other every row. Each bell can only change position with a bell ringing before or after it. There are many "methods" which ringers learn, of varying degrees of complexity. The methods are defined by diagrams which show which position a bell rings in each row. Half-muffled Bells may be rung half muffled for events like Remembrance Day where a solemn sound is required. A leather muffle is firmly fixed to one side of each clapper. The bells sound loudly when swung in one direction, and softly when swung in the other direction. If, say, 8 bells are being rung, the listener hears 8 loud notes followed by 8 muffled notes, sounding a little like an echo. Meetings Hexham ringers are members of the Durham and Newcastle Diocesan Association of Church Bellringers an organisation which links ringers from all towers in the north east. At a meeting, ringers come together from other towers in the Association to ring together and to socialise. Peal Defined as 5000 or more "changes" or "rows". Each ringer therefore pulls the rope 5000+ times. Ringing is continuous and no "rows" should be repeated until "rounds" is returned to at the end. Peals at Hexham take about 3 hours 5 minutes to ring. Quarter peal Literally a quarter of a peal so a piece of continuous change ringing with a minimum length of 1250 changes and no rows repeated. This takes between 45 and 50 minutes at Hexham. Simulator A device that can produce the sound of each bell through speakers in the ringing chamber, enabling the bells to be rung with the clappers fixed, and therefore silent outside, while ringers listen to the simulator inside. Particularly useful for teaching beginners. Striking Anyone with a good sense of rhythm and a good ear can judge whether the striking is good or not. Good striking is defined as each bell sounding on the beat, all bells equally spaced from each other. When the striking is bad, bells sound erratically, with gaps, and then groups of bells sounding in rapid succession, or sounding at the same time. Striking Competition Most of the time, ringing is not competitive. Once or twice a year though, ringers meet at a tower somewhere to see which band can produce the most rhythmic, "evenly-struck" ringing. Hexham has won quite a few competitions over the years. 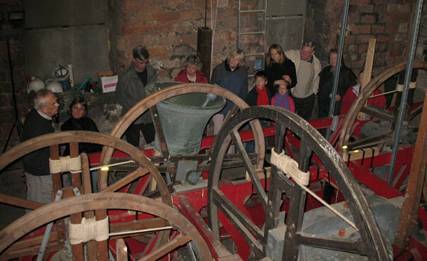 The picture below shows the ringing chamber during our open day on 8th December 2007. We have plenty of space, and we have made it quite comfortable. We do spend a lot of time there. Yes, that is a children's play pen in the corner. If you would like to see the ringing chamber and the bells, our annual open day during the Abbey Christmas Fair is a good opportunity. The three boards up on the left hand wall are peal boards: records of peals which have been rung for special occasions in recent years. The picture below was taken in the bell chamber, again on the open day. The bell in the centre of the picture is in the "raised" or "up" position, ready to be rung. All the other bells are down. The people listening to the talk are a safe distance from this bell – there is plenty of space in the bell chamber at Hexham.